Bubbles machine tests, bubble solution tests, and strange things to do with bubbles. Before getting started, how about some big bubbles?! I'm currently working on a seperate page about how to blow giant bubbles. When it's done I'll post a link to it here. This page chronicles the bubble solution and bubble blowing machine tests I've conducted over the last ten years. I hope it helps anyone interested in blowing the best bubbles find what they need. Here's a picture of some of the solutions and machines I've tested. From left to right: Theatre Effects bubble juice (a bomb), Bubble-Pro bubble juice (okay), Visual Effects Inc. bubble juice (outstanding! ), Bubble Pro machine (poor wand design), Visual Effects Mini-Bubbler (good), Unique bubble solution (okay), Imperial bubbles (so-so). Unfortunately, both bubble machines are flat black and impossible to get a get a good photo of. I enjoy setting up a bubble machine in the back yard and letting the bubbles drift all over the neighborhood. They never fail to make children and adults alike smile. Here are the results of a few tests on bubble mixtures I've tried, comments on bubble machines, and links to other, more complete, bubble sites. All of my comments pertain to lightweight bubbles intended to float on the wind. Heavy, durable bubbles for fixed displays are not addressed here. I've coined two terms to help compare different bubble solutions: the dip and the blowout. A dip refers to dipping a bubble wand into a solution and seeing how many bubbles it generates on average. For the tests listed below, many dips of each solution were used to build an average of how many bubbles the average dip provides. A blowout is when a bubble machine's dipper moves in front of its fan and the bubble solution is blown away without generating and bubbles. Weak solutions, like Mr. Bubble, when used in the bubble machine I used to test the solutions, had seventy percent blowouts. This is a case where the lower the percent blowout, the better the bubble solution. A zero percent blowout means that the solution produced bubble continuously with no breaks in production. Please note that bubble lifetime is strongly determined by environmental conditions. Bubbles are notoriously short-lived on hot, dry, dusty days and can last for minutes on cool, shady, humid days. All of the tests comparing solutions were made at the same time and under the same conditions. These are the small bottles found in grocery and toy stores. Mr. Bubble, the most common brand, was the worst of the commercially prepared solutions tried. The color is weak and the bubbles last less than thirty seconds. I got an average of ten bubbles per dip. Mattel, sold as Hot Wheels Bubbles and other names, it's preformed the same as Mr. Bubble. Imperial bubble solution bubbles seem to have a little more color and last about ten seconds longer. I got an average of 15 bubbles per dip. Unique bubbles where the best of the grocery/toy-store grade solutions tested. It generated the most bubbles per dip (up to 18) and they outlasted the other three solutions. These worked so well I tested them against the professional-grade solutions. Pustifix, from Germany, has very strong colors and the bubbles last up to one minute. The problem is that this solution is very hard to find. Your best bet is a high-end toy store. Actually, Pustifix should be listed with the professional grade solutions but it's been placed here because I've only found small bottles of it in toy stores and it's very expensive. IMPORTANT UPDATE!!! I've found an on-line source for Pustefix bubbles that is very reasonable and sells up to 33-ounce bottles of it. Please look below in the Links section for the address. These are usually sold in quart or gallon bottles and are supposed to be superior to commercial grade solutions. All of the following tests used a V-9903 Mini-Bubbler bubble machine by Visual Effect Inc. As a baseline for comparison, Imperial solution had a fifty percent blowout rate: half of all the wands that passed in from of the air source failed to produce any bubbles. I would have liked to test Pustifix in the machine but the only bottle I had was an old one and there wasn't enough of the solution to work in the machine. Theatre Effects This solution preformed so poorly I have to think there was something wrong with the bottle I purchased. The blowout rate was ninety-five percent. In other words, the solution was so weak that it produced effectively no bubbles. At eleven dollars a quart, I expected something much better. Unique had a twenty percent blowout rate. This is getting into the realm of a very good solution. Bubble Pro did very well with a ten percent blowout rate. The bubbles had good color and lasted up to forty seconds. At three dollars for a quart bottle, it was also the cheapest of the solutions. Visual Effects Bubble Juice is the best I've ever used. The blowout rate was zero: the machine could run for minutes (representing over one hundred dips or tests) and never cause a single blowout. The bubbles are brightly colored and last up to a full minute. I've even seen bubbles dry in the air and hold their shape. These dry bubbles look like a network of spider webs supporting a thin, transparent shell. If these dried bubbles pop in the air, the gauzy remnant is so light that many times it will continue to float. I believe these effects are the result of the solution containing some corn syrup to prolong the bubble's life. This product is difficult to find. Contact the Visual Effects website at http://www.visualeffectsinc.com for a distributor near you. This solution cost twelve dollars for a quart. It's available from the http://www.coolstuffcheap.com/bubjuicgal.html website for as little as $15.95 per gallon, as of January, 2005. NEW GREAT SOLUTION FOUND!!! I found that the Gazillion Bubbles (Sold at Toys "R" Us and Walmart) produce long-lasting bubbles that have a lot of color. Toys "R" Us also sells a brand labeled "Fantastic Bubbles," made by the Billion Bubbles people. It's labeled as being "extra thick." This solution worked okay outside but inside under controlled conditions the Gazillion bubbles lasted ten times longer (145-seconds compared to 15 seconds.) In March of 2006 a 32-ounce bottle of Gazillion bubble solution cost $5.49 in Walmart and Toys "R" Us. A 64-ounce bottle cost $7.49. Note: The "Gold" type of Gazillion bubbles has been variable in quality for me. Two bottles were outstanding but one was a failure: the bubbles wouldn't blow or if they did they popped quickly. I haven't had this problem with the non-gold types. With the availability of Gazillion Bubbles, I decided to double-check my evaluation capabilities. I purchased a jub of the cheapest bubble solution I could find: Miracle Bubbles for $2.39 a gallon as well as some new Gazillion bubbles. Inside, a bubble blown on a flat surface using the Miracle solution only lasted 15 seconds. The same size bubble from the Gazillion solution lasted 2 minutes, almost ten times as long. Outside the story was a little different. A 10-inch diameter Miracle solution bubble lasted an average of 10 seconds. A 10-inch Gazillion bubble lasted an average of 20 seconds, better but not enormously so. The color of the Gazillion bubbles appeared slightly brighter, but this is hard to judge. Bubble longevity outside is influenced greatly by bubble size. Using Gazillion bubble solution I found that a 4-inch bubble averaged 60 seconds, a 6-inch bubble 30 seconds and a 10-inch bubble 20 seconds. Bubbles 2-feet across were lucky to last 10 seconds. This professional grade bubble solution is sold by the people who hold the record for blowing the world's largest bubble (105 cubic feet.) The 16 ounces of concentrate is mixed with 14 cups of tap water to make one gallon of bubble solution. The cost is $10. Beeboo bubbles are much harder to blow using standard toy bubble blowers. BeeBoo's special formulation works best using blowers designed specifically for it. They offer these blowers on their site. The intensity of the colors was the same for both products. This is a remarkable accomplishment considering longevity is usually linked to thicker bubble walls, which reduces color. BeeBoo bubble solution manages to accomplish two things at once: increase bubble life and maintain thin bubble walls to provide maximum color. BeeBoo bubble solution deserves consideration for anyone wanting to blow very large bubbles or bubbles that last a long time. I spotted this package of bubble wands in Wal-Mart for $1.50. They are standard bubble wands coated with a dry soap solution. When dipped in water the soap dissolves enough to form a film. Held upright, I could only get two or three bubbles per dip. By holding the wand flat, that could be increased to five of six. The bubbles don't last very long, but that's a fair trade off for the convenience and the fact that you don't have to worry about children spilling soap solution on the carpet. An important point is that if there is the tiniest bit of fat, oil or grease in the bowl, the bubbles won't form. These aren't nearly as good as even the cheapest jars of bubble solution. Mrs. April Koebert, a very dear friend from high school, sent me some pencils with the top half converted into a small holder for a bubble wand and bubble solution. The pencils are blue with a blue heart as the end cap. The only writing on the pencils, which came from a Paper Warehouse store in Colorado, is "Made in Taiwan." This is the strongest, longest-lasting bubble solution I have ever found. The bubbles last up to half an hour. Many times they dry and still hold their shape. They also have excellent color. I readily recommend these pencils to anyone needing long-lasting bubbles. There are, however, two problems: when the bubbles pop they leave a residue and the vials only hold enough solution for a few blows. Still, they are outstanding. Update: Wal-Mart started selling much larger bubble sets containing the super-bubble solution mentioned above. For $2.00 you get 1/4 cup of solution in a handy clip-on holder that contains a small bubble wand. This set is called "Catch-A-Bubble" because the bubbles are so durable that after drying in the air for ten seconds they are strong enough to be gently gathered and stacked. They last for hours and often don't pop even when they touch dry dirt or carpeting, sure killers of regular bubbles. Again, the solution used will leave a residue on clothes and surfaces. Party America stores sell the Lite F/X bubble Machine (model 1761) for $40. It's an attractive, compact, easy-to-use device that runs on either 8, AA batteries or a power cord. It'll run for ten minutes before foaming, a problem in almost all machines, starts to become a problem but even then it delivers a heavy stream of bubbles. I tried Kookamunga Catnip Bubbles. They didn't seem to interest either of my cats and didn't last very long compared to premium bubble solutions. 1 part Ultra Joy dish soap, 15 parts water: popped immediately. 1 part Dawn, 15 parts water: popped immediately. 1 part Ultra Joy, 12 parts water: popped immediately. 1 part Ultra Joy, 15 parts water, .25 parts corn syrup: 3 bubbles per dip, lasted 20 seconds. 1 part Ultra Joy, 15 parts water, .25 parts glycerine: 2 bubbles per dip, lasted 20 seconds. 1 part Ultra Joy, 12 parts water, .25 parts corn syrup: 4 bubbles per dip, lasted 30 seconds. 1 part Ultra Joy, 12 parts water, .25 parts glycerine: 2 bubbles per dip, lasted 20 seconds. 1 part Ultra Joy, 12 parts water, 1 part corn syrup: 2 bubbles per dip, lasted 30 seconds. 1 part Ultra Joy, 8 parts water, .25 parts corn syrup: 5 bubbles per dip, lasted 30 seconds. 1 part Ultra Joy, 6 parts water, .25 parts corn syrup: 5 bubbles per dip, lasted 30 seconds. As these tests indicate, the bubble production of a wide range of homemade solutions per dip is much less than even Mr. Bubbles and the bubble life isn't any longer. Corn syrup works better than glycerine but it has the drawback of leaving a small, gauzy residue that may attract insects. I also tried adding two teaspoons of corn syrup to 3/4 of a cup of Imperial bubble solution. In my bubble blower it increased the number of bubbles produced per minute from 200 for Imperial by itself to 300, but this is still far below the 400 per minute rate achieved using Visual Effects Bubble Juice. Many of the sources consulted for homemade mixtures suggested letting the solutions sit overnight before using. The reason given was that this allows certain aromatics to evaporate, making the solution more stable. While this may be true, my own observations suggest another reason why mixes left overnight work better than newly-made solutions. Glycerine, corn syrup and soap are viscous and resist mixing. I've observed long thin strands of them existing in water even after a full minute of stirring. Used in this state, the bubble solution isn't completely mixed, which means when a bubble is blown from it, there will be areas in the bubble wall where the solution is weaker and more prone to break. Letting the mixture sit overnight allows the various components to dissolve completely into each other. This makes the solution uniform and stronger. 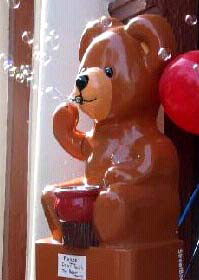 Bubble blowing machines range in price from $30 to $1500. They are classed by the number of bubbles per minute they produce. Little battery-powered units turn out 600 bubbles per minute. High-end machines can manufacture over 25,000 per minute. My preference is (was) the Mini-Bubbler. The battery-powered option, ability to be used with a much smaller amount of bubble solution, low frothing, and its resistance to producing multiple bubbles more than made up for the slower production rate of bubbles. It's happy face and interestingly articulating arms make this a nice little bubble machine for children's parties. It produces 100 or so small bubbles per minute and appears to work very reliably. A cam bobbles the head to add interest. The downsides are that the reservoir doesn't hold very much bubble solution, there isn't a pour spout for emptying it and it's one of the noisier machine I've tested. Walmart is selling a battery-powered bubble gun for $5.00. Although one of the three I bought didn't work, the other two produce a steady stream of bubbles. These guns can be temperamental but when they work, they really put out a lot of bubbles. They are also much neater than any of the other machines I've tried. They don't foam up and don't drool as much bubble solution. The optimized bubble mixture I discuss further down the page works much better than the solution provided with the guns. TWO GREAT BUBBLE MACHINES TESTED!!! It produces enormous quantities of brightly colored bubbles (when used with Gazillion bubble solution), is the easiest and cleanest machine to use and has a unique holder for a bottle of bubble solution that automatically keeps the solution reservoir filled. Unlike the Billion Bubble Machine (below) this Gazillion bubble doesn't run out of solution after only a few minutes. Although small and marketed as a children's toy, this bubble machine is the best I've ever used! Sometime in 2012, Funrise changed the design of this great machine and switched manufacturers from China to Vietnam. The new design has three small legs instead of a large round pedestal. The result is that the new model is much easier to knock over and tends to rotate and drift because of vibrations from the motor. Even worse, the machine now tilts back so far the bottle is no longer held in the holder. You have to fill the small reservoir every few minutes. Finally, the new manufacturer appears to have much looser tolerances on the machine parts. All the gears grind much worse than those made in China. I purchased five of these new machines in 2013. Three vibrated so bad they spun around and will fall off the side of a table if not restrained. The remaining two still vibrated badly enough to drift around some but not as bad as the first three. Please help save what was one of the great bubble machines. Email Funrise (customerservice@funrise.com) and please ask them to go back to the original design. Thank you. Introducing the Bubble Storm 2000!!! I've always wanted a bubble machine that would fill the entire back yard with countless bubbles. I never found one so I decided to make my own. I started by cutting a 20-inch circle out of the center of a card table. A three-speed fan was mounted under it blowing up through the hole and seven high-output Gazillion bubblers were placed around the fan blowing bubbles into the updraft. The result is a monster bubble system that pumps out a thousand bubbles a second and sends them 30 feet into the sky. It's impossible to describe the overpowering magnitude of seeing such a high bubble density filling so much of the sky. The particular Hover Bubbler I purchased (photo above) made by Imperial Toys is the worst bubble maker I've ever used. It's supposed to pump bubble juice up from the yellow bottle at the bottom to fill a ring-shaped reservoir at the top. When the trigger is pull a "D" shaped half ring pivots from its resting place in one half of the reservoir to the other, supposedly creating an arc of bubble film that the internal fan then blows into a large bubble. The pump in mine never worked even though I used brand new batteries and let it run for five minutes. Failing that, I filled the circular reservoir manually and attempted to blow a bubble. It didn't work. Regardless of how fast or slowly I pulled the trigger the fan was so strong that it burst the bubble before it could form. Worse still, the fan invariable blew a spray of bubble juice in all directions. Perhaps the one I got was defective but even using all my experience with bubblers I couldn't get it to work or figure out how it could ever be modified to work. The Ghost Bubble machine by Peterfish toys worked better, but it too was disappointing in many ways. This bubbler has a small built-in smoke machine that's supposed to created smoke-filled bubbles by dipping the yellow bubble wand at the top in bubble solution, turning it upright, then pressing either the fast (top) or slow (lower) trigger on the left side to engage a fan to blow the bubbles. It works... but only after a fashion. It takes a full minute for the smoke maker to create enough smoke (fog actually) to fill the chamber beneath the wand. Once filled, the wand can be dipped and one of the triggers pressed to blow a bubble. Then the problems start. The fan was strong enough to burst some of the bubbles formed on my particular machine. Those that didn't were so firmly attached to the wand that they never broke free. To get them off I had to blow on them. Worst of all, the amount of fog in air drawn in to inflate the bubble is so low that the resulting bubble ends up only looking faintly cloudy. The final killer for this machine is that you have to wait another full minute to produce enough smoke to try making a second bubble. Failing to do this only makes a normally transparent bubble. I doubt many children will want to wait that long. One last issue is that this is a messy toy to use. It's almost impossible for a child, or even me, to dip the wand and turn the machine upright without dripping bubble solution on the floor. Still, this machine is not without promise. I found that once the bubble had started to form if I covered up the air inlets the force of the fan was reduced enough so that the bubble was less likely to burst. The architecture of the machine makes is easy to install a plastic tube that would allow helium to be added to the air used to inflate bubbles so that they would float instead of sink. Finally, using a larger fog machine to supply all the filling needed to inflate a bubble, which would make the bubbles appear more solidly filled with smoke. Combining both of these last two ideas would enable someone to create smoke-filled bubbles that floated. The price to pay for this, besides the expense of the helium, a fog machine and various plumbing fixtures, is that the resulting unit would be large, heavy, and awkward to use. 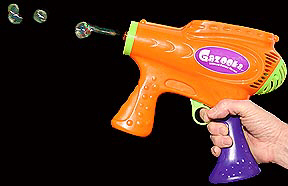 I'm pleased to report that the Gazooka bubble gun by the people at Gazillion bubbles is a winner. It produces a solid stream of 1-inch diameter bubbles that last a long time. The handle holds enough solution for five to ten minutes of constant bubble production, much longer with normal on-and-off use. The fan is strong enough to blow bubbles even if the gun is facing a 10-15 mile per hour wind. There are a couple of things to be aware of with this gun. First, like all guns it's designed to be held in an upright position. Tilting may cause spills. Also, the wand drains quickly so if you stop blowing for more than one minute they may not start immediately. What needs to be done is to press the trigger briefly, release it, then press it again. That rewets the wand. The bubbles should start right away. Occasionally the gun stops blowing bubbles even while the trigger is being fired. If this happens, just release and repress the trigger and the bubbles will start again. The handle holds almost the entire bottle of bubble solution sold with the gun. The problem here is that you almost get done pouring and because the bottle's almost empty figure the handle was sized to hold the entire amount of solution. Just when you think you're done the handle overflows. Not a big issue but a messy one. At $13 in Wal-mart the Gazooka is reasonably priced. I give this gun a solid thumbs-up. It's a small but bulky unit that produces a very good stream of bubbles and doesn't foam up. The 12-inch tall bubble machine has many new and innovative features. First, and most importantly, it has a built-in fan that blows the bubbles straight up instead of forward. Because of this the bubbles remain in the air much longer. Second, it has a large base filled with bubble solution that not only provides enough bubble juice for up to an hour of continuous use, but acts as a heavy base to stabilize the bubble machine. All this goodness comes at a price. The bubbler has to be flushed with warm water after every use. If not, bubble solution could dry out and gum up the pump used to move the bubble solution from the reservoir to the bubble wands. As of Summer or 2006, this machine is very hard to find either on the west coast or even on the Internet. The two biggest faults with this machine are (1) the soft rubber straps that hold the bubble juice container to the bottom of the machine pop off easily and (2) even gentle side breezes can greatly reduce the bubble flow because they disrupt the flow of air up through the machine. 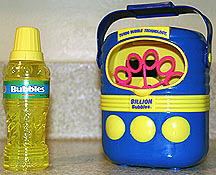 The Billion Bubbles machine by Kidsstuff became available March, 2006 in Rite Aid variety stores. It runs on 6 AA batteries and produces an excellent quantity of bubbles. The bubbles are larger than usual and the bubble solution packaged with the machine produces durable, long-lasting bubbles that have as much color in them as the top-priced Pustifix solution. This machine weighs about a pound (with batteries), measures 6-inches square and three deep, fills and empties very easily, and doesn't seem to foam up as quickly as the other machines I've tried. About the only bad thing I have to say about this little gem is that it produces so many bubbles the bubble solution reservoir runs out of solution in as little as five minutes. I've only had mine for one day so I can't comment on its long term reliability, but for now it's bubbling up a storm. 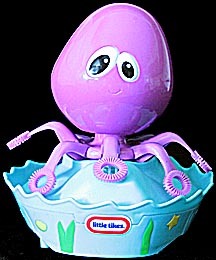 Worthy of mention is the Ultimate Bubble Toy by Gazillion Bubbles, also available at Rite Aid stores in March of 2006. For $10 you get a large bubble wand, a pan to hold bubble solution, a large bottle of top quality bubble juice, and a 30-minute DVD showing bubble artist Fan Yang doing all sorts of unbelievable bubble tricks. Even if you don't use the bubble kit the DVD is worth the purchase price. In June of 2008 I saw a TV commercial for Gazillion's Jumble bubble machine ($20 at Walmart.) Unlike the Typhoon, this machine uses a reciprocating half-circle to pull bubble solution up and over the fan to produce much larger bubbles. Better still, an inner, smaller half-circle blows smaller bubbles inside many of the larger ones. This unit is 9-inches tall, making it shorter and more stable than the Typhoon. The straps holding the bubble solution reservoir to the bottom of the blower are much stronger than with the Typhoon, reducing the chance of the reservoir accidentally falling off. Mechanically I rate this machine much better than the Typhoon. make the Jumbo Bubble Machine much more entertaining than the Typhoon. As mentioned in the title of this review, The people at Gazillion Bubbles have done it again: produced a first-class bubble machine that really delivers the goods in terms of providing tons of outstanding bubble entertainment. DEFY GRAVITY! As light as they seem, bubbles are still heavier than air and will fall to the ground and burst unless a breeze sustains them. This makes using a bubble machine on calm days or inside difficult. Fans placed under the machine and pointed upward don't seem to work, create rapid swirling motions that don't look right with bubbles, and cause many of them to break. Here is an easy solution. Buy a helium balloon kit ($20 at most variety stores) and run a plastic tube from the tank's nozzle to the exhaust port for the fan on the bubble machine that inflates the soap bubbles. Turn the valve on low and adjust the flow until the bubbles float with neutral buoyancy. I found the flow rate needed to do this to be very low and a tank of helium can last for hours. I took the output from a smoke generator, mixed it with helium from a party-balloon kit and ran the combination into an automatic bubble maker. The result was smoke-filled bubbles that floated instead of sank. They looked like giant floating pearls. A final word: Bubbles are great but be warned that they are messy. Solution inevitably gets spilled, machines froth, and if the wind blows against you, you'll get slimed with bubble goo. Still, in the long run, as they climb high in the sky attracting smiles from anyone who sees them, there can be no doubt that they are worth it. The most brightly colored bubbles I've ever used are Pustefix. You can order them on-line from Tangent Toys at http://store.yahoo.com/tangenttoys/pusref.html. These bubbles have intense swirling colors that put all other brands to shame. They are also very long lasting. 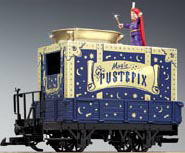 If you are into "G" scale model railroads, there is a Pustefix bubble-blowing car that really captures 2-to-4-year-olds' attention. An interesting and beautiful artform you might want to try if you enjoy photography is capturing the swirling colors of Pustefix bubbles when they are blown into various shapes. The following sites will provide more detailed information on bubble physics, just take their recommended bubble solution formulas with a grain of salt. Because THIS AND THAT is a strictly non-commercial site I refrain from posting advertisements for sites that market products for sale. This is one case where I'm breaking that rule because it's such an outstanding idea. I want to make it clear that I'm in no way connected with this company and derive no financial gain from it in any way. They just market a great product that I think many people would like to see and some of them, if they own a retail store and want to attract people (especially children) to their store, might find profitable to purchase. It's the Streetbear. This is a great webpage featuring pictures of hundreds of rare and exotic bubble blowers. Visit Tom Noddy's outstanding site at http://www.tomnoddy.com! Tom Noddy is a professional bubble blower who has delighted millions of people around the world and even was a featured act on Johnny Carson's Tonight show. I highly recommend visiting his outstanding site. Mr. Noddy very kindly sent me an email with some interesting comments about bubble solutions. I'm posting them here for anyone who might be interested in more than simply blowing single bubbles. My name is Tom Noddy and I am a professional bubble blower. I started 34 years ago playing with bubbles and stayed with it. In the early 80s I performed my act, Bubble Magic, on the Tonight Show and then I created a Bubble Festival for the Exploratorium science museum in San Francisco. Now there are a handful of other bubble performers and bubble exhibits at all science musuems. Right now I am in Berlin, Germany performing in a Variete theater but I live in Santa Cruz, California. I use Mr Bubbles for my act because it is so flexible is that it is relatively weak. Glycerine rich formulas make longer lasting bubbles but when I try to blow a bubble inside of one (by giving it a quick blast of air from my mouth) it is too rigid to stand up to that and snaps instead of bending in on itself and forming other bubbles inside as I do in my stage show. Again, I encourage everyone to visit his site at http://www.tomnoddy.com. The pictures of some of the things he gets bubbles to do are unbelievable. Please click HERE to visit my main site and browse 90 other pages.